On-Site Chair Massage is the number one stress reduction and wellness program in America today. More employers are aware of the tremendous impact that Chair Massage has on work related stress and employee’s burn out. 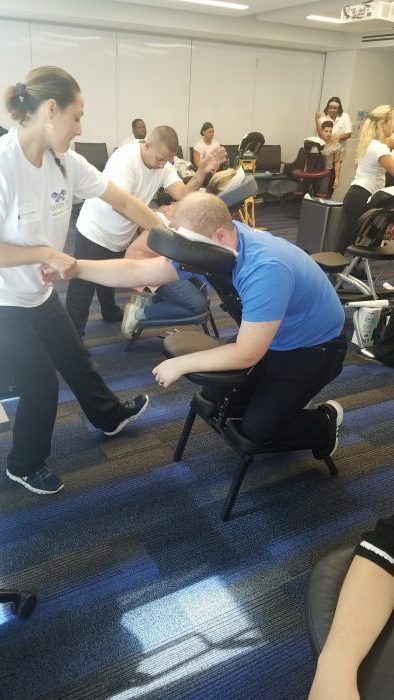 On-Site Chair Massage can be use to: Improve employee’s moral, increase productivity, reduce absenteeism, reduce the high cost of health insurance, and gift to clients. Onsite Massage can also be used for: Employee’s appreciation day, Special events, and corporate events. Whatever the occasion, On-Site Chair Massage is always welcome. Give us a call today or contact us through our request a quote page. We look forward towards speaking with you. This service will without a doubt, be appreciated by your employee’s and can reflect a positive Attitude and Morale towards the company. We can make arrangements to have one to fifteen (15) Massage Therapist come to your place of work. Book us for a minimum of three hours. Contact us through our request a quote page or call us today. We look forward to working with your Company now or in the near future.